Wait, it gets worse… Recently Trump’s EPA – that’s the “Environmental Protection Agency,” run by a Trump-appointed former coal lobbyist, Andrew Wheeler, has announced the reduction of pollution restrictions on coal-fired power plants, which by their own published estimates, (which you know is lowballing it,) will result in some 1,600 more emphysema-related deaths a year… Those deaths would more than equal another 9/11 every two years! Yes, from now to until someone with a soul takes charge, every other year your Prez, Donald Trump, presents you with a whole new 9/11′s worth of unnecessary deaths… So who says that he isn’t looking out for the common man?? Katz COULD pass on the account info he used to hack into the Kruddistan Treasury (remember the shady characters looking for “a boonny und a cat?”) maybe the baddies will chase someone else instead. Sgt Bilco smells a profit. 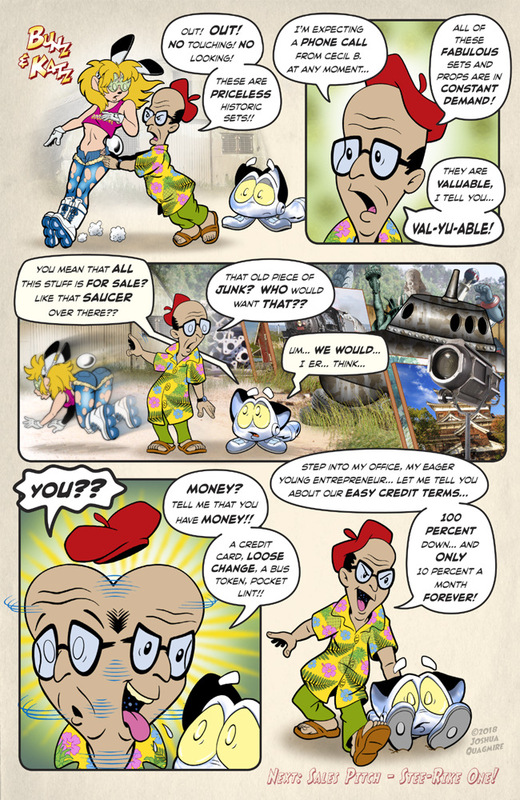 You know, it’s somewhat revealing to think about characters like Bilko and “Crapgame” (from Kelly’s Heros). Bilko was written by men who had either been in or lived during WW2. (Creator Nat Hiken was not in the war but knew plenty about it.) They had talked to people who had actually known supply types who ran scams like that during the war. The supply system in the ETO was infamous for not getting the best and newest equipment/rations to the guys on the front lines because it was being skimmed off in the rear areas either for personal use or profit. Also, that character, I believe his name was Milo something, who turned an entire wing into his personal force. I am getting the sense of a long and time honored tradition of corrupt military movie/TV show supply types here. Must be based on something real eh? Milo Minderbinder is the name you’re looking for Bruce… I used to tell people that if they wanted to understand the Military mindset, they should watch “Catch 22″ and “Dr. Strangelove” over and over and over again, until they begin to make logical sense… When they do, you’ll have grokked the military mindset!! 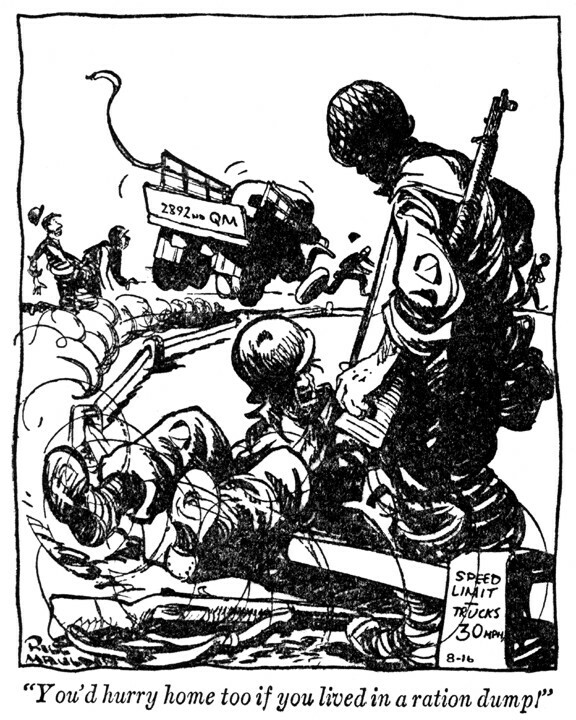 Hey Josh, I remember seeing a “Willie & Joe” compilation book years ago, and French supply convoys were considered more dangerous to encounter than a German Panzer column! It also had a salute to the famed First Special Service Force (Devil;s Brigade) in at least 2 different cartoons. The occupied Japanese also became skilled “wheeler-dealers” with their occupiers’ military goods… when I was in grade school, ‘way back in the ’50s, one of my teachers, a vet, described how large and heavy military equipment would mysteriously end up being cut up in local scrapyards, all with proper paperwork… I imagine the yakuza were in charge. I remember reading about what happened in Viet Nam. Stuff was diverted direct from the ships in harbor to “grey markets”, and sometimes right into the hands of the enemy! Because we were “guests” in that country, we had to put up with it.